Starting this June, the mighty ARMORED SAINT will head back out on the road, playing to fans across the world this summer! The first run of dates kicks off in the USA, with the band joining METAL CHURCH for a special West Coast trek. ARMORED SAINT's Joey Vera (bass) comments: "We're super excited to go back out for some select dates this summer. 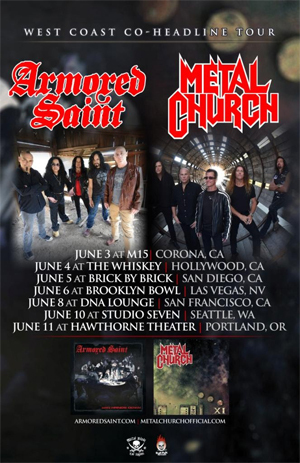 The June dates with METAL CHURCH are a fan-made match that is sure to be an amazing time!"